Kathmandu, November 9: Environment and Public Health Organization (ENPHO) together with USAID organized a conference to explore possibilities for promoting safe water and sanitation through the regular activities of private sector companies. Executive Director of ENPHO, Bhushan Tuladhar, Joint Secretary at the Ministry of Physical Planning and Works Suman Sharma, Peter Oyloe Resident Advisor AED N-MARC and Suranjan De, CEO of Varun Beverage Pvt. Ltd (Pepsi) addressed the conference. After experiences sharing on PPP approach for safe water promotion, certificates were distributed for committed partners. Organizations that have expressed their commitment include DHL, Koshi Gas, Nepal Pharmaceutical Laboratory, Mero Mobile, Kathmandu Guest House, and Rural Microfinance Development. Dhulikhel, November 10: Environment and Public Health Organization (ENPHO) has signed an agreement with Japan Water Forum Fund to implement water and sanitation improvement project in primary schools of Dhulikhel Municipality. The project, which focuses on three schools, Chayal Devi Primary School, Kali Devi Primary School and Mandaladevi Primary School, aims to improve the hygienic condition and ensure safe drinking water and proper sanitation in the schools and surrounding community through School Led Total Sanitation (SLTS) campaign. The program is integrated with the ongoing UEIP program of Dhulikhel Municipality. An orientation program on SLTS was conducted to 25 schoolteachers, school management committee and parent teachers association on November 10 where they have committed to declare their area as open defecation free area. Lalitpur, November 22: NGO Forum for Urban Water and Sanitation organized an interaction programme on traditional stonespouts initiatives to share experiences and works carried out in the restoration of Tusa Hiti Project funded by the Embassy of German Government and implemented by Kathmandu Valley Preservation Trust (KVPT). Highlighting the on-going activities of the Kathmandu Valley Preservation Trust, KVPT Nepal Programme Director Dr. Rohit Ranjitkar told that KVPT is working to safeguard the architectural heritage of the Kathmandu Valley. Prayag Raj Joshi, KVPT Consultant presented different activities carried out by the KVPT for the restoration of Tusa Hiti. He further informed about the major activities undertaken by the trust including cleaning of historical channels from Kot to the respective spouts (Tusa Hiti), repair and maintenance of the damaged channels in the same area and replacement of damaged historical channel by pipeline from Hakha to Saugal. He continued that the remaining works to be carried out in the project are extension of the alignment up to the main source, replacement of the outlet up to Bhindyolachhi hiti, repairing of old drain at Chyasal and restoration of historical Bhandarkhal pond. He informed that the total budget allocated for the project is Rs. 8.8 million and the total spending on completed works so far is Rs. 2.46 million. Padma Sunder Joshi, executive director of Centre for Integrated Urban Development shared the activities in Sundhara, Lalitpur and informed that the CIUD is holding meeting with Sundhara community to discuss about the Nuga hiti issues. Prakash Amatya, executive director of NGO Forum for Urban Water and Sanitation thanked Dr. Rohit Ranjitkar and Prayag Raj Joshi for their cooperation in the programme. He told that the objective of the interaction programme was achieved successfully and worthy feedbacks and suggestions were collected for the betterment of the project. Lalitpur, November 24: UN HABITAT launched its new publication titled "Building Prosperity: Housing and Economic Development" globally on November 24, 2009 by organizing various events in more than 100 different countries including Nepal. The book had been launched to coincide with Goteborg Award distribution ceremony, which was awarded to author of the book, Anna Tibaijuka, Executive Director of UN HABITAT the UN Agency for the built environment. She was honored for her contribution in sustainable development of environment and housing sector. Speaking at the programme, Habitat Manager of UN HABITAT Nepal, Prafulla Man Singh Pradhan told that the contribution of the supply and consumption of housing on economic growth has been explained with the support of detailed case studies and examples of best practices in the book. He believed that it would be easy, better and effective to adopt these successful practices rather than looking for new approaches for housing in Nepal. 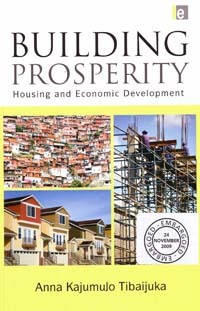 Secretary General of United Nations, Ban Ki-moon has expressed that the book can be helpful to identify concrete policies and institutions to enable governments to incorporate broader vision for the housing sector that goes beyond the traditional argument of social need and towards an enhanced contribution of housing to accelerated economic growth. Despite having central role in economic growth, housing is treated as a sector of mere social good. The book was developed to fill the exiting gap between housing and economic growth. It has aimed to raise awareness about the central role of housing in economic development, and to propagate this message in academic as well as the policymaking and investment circles, Tibaijuka said. In her book, she has recommended to pursue housing provision vigorously, given its importance to social and economic growth, development and the creation of national wealth. 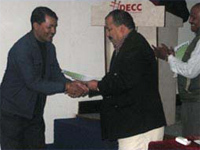 Kathmandu, November 27: WASH Nepal Chapter organized National Media Award on November 27, 2009. The award was based on media coverage within 6 months (June to October 2009) and contents submitted for the media award. The jury comprising of media and WASH stakeholders selected best six journalists from all five development regions and Kathmandu. There were also encouragement awards and appreciation letters to other media stakeholders who noteworthy contribution in the sector. Based on the contents submitted, six participant journalists namely Gopal Chandra Rai (Nepal Samacharpatra Eastern Region); Rama Dahal (Kantipur Television Central Region); Shiva Apriya (Annapurna Post Western Region); Kalendra Sejawal (Nagarik, Mid Western Region); Shivaraj Khatri (Sudur Sandesh, Far Western Region) and Dipak Dahal (Nagarik, Centre Region) were declared as the winner and awarded cash prize of NRs. 7,500 each for their best feature write up on sanitation issues. 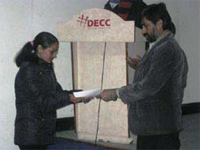 Shakti Kumar Pun, Annapurna Post, Mid Western Region and Chandra Bania, Radio Nepal, Central Region was also awarded with consolation cash prize amounting to NRs. 3,500. Speaking at the award distribution programme, Dharmendra Jha, President, Federation of Nepalese Journalists (FNJ) emphasized on promotion of social responsibility of media. He appealed the media stakeholders to give more attention to the health and hygiene news and coverage. He opined that increased recognition add more responsibility to retain the gain. Umesh Pandey, WASH Nepal Coordinator, discussed on pivotal role of media to enhance accountability of state to address people’s concerns. He requested the media stakeholders for analytical reporting which will support in improving efficiency of the organizations. Kamal Adhikari, Sociologist, Department of Water Supply and Sewerage shared that the government had initiated the process of developing media strategy with the aim of mainstreaming media. “There should be single focal point for providing information to the media stakeholders,“ he added. Rabin Lal Shrestha, Research and Advocacy Manager, Water Aid Nepal focused on increased accountability for minimizing annual death due to sanitation deprivations. He shared that unequal distribution of resources and development would not allow the universal access till 2031 that is way behind the national target. Prakash Amatya, Executive Director, NGOFUWS suggested to hype the event to make it more national event and requested the government agencies for replicating these initiatives of media engagement. He shared that there should be increased linkages with the media and WASH stakeholders to raise mutual trust amongst each other. 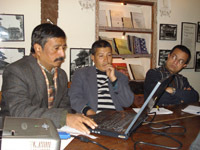 Bharat Adhikari, communication officer, NEWAH shared analysis of media monitoring based on the print media coverage of selected national papers during June to October 2009. Gorkhapatra, Annapurna post and Kantipur daily were the ones who had large coverage of sanitation news. 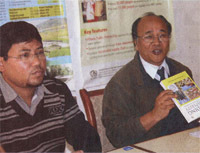 He shared that there is 1:9 ratio between news of water and sanitation mainly due to the Jajarkot disaster. Shakti Kumar Pun, media award winner expressed that the hardships journalist should undergo to do reporting of remote areas. He shared that the reports should be conveyed through mobile phones. 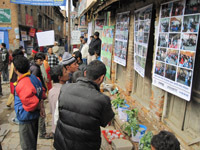 Kavre, November 28: Centre for Integrated Urban Development (CIUD) and Nala Integrated Development Committee Nala jointly organized Sanitation Exhibition at Nala, Kavre in coordination with local community. Talking about the sanitation exhibition, Mingma Gyalzen Sherpa, PhD researcher at AIT/EAWAG told that the exhibition was mainly organized to disseminate knowledge on different sanitation systems so that the locals can take right decisions while selecting sanitation systems for their household and community. “Over 1000 people witnessed the daylong sanitation exhibition,” says Shyam Sundar Shrestha, Chairperson of the Nala Integrated Development Committee. Several sanitation options such as Urine Diversion Systems, Double Pit Latrines, Septic Tanks, Decentralized systems such as Biogas, Constructed Wetlands, urine reuse option through Struvite (Phosphorous abstraction) and household water disinfection options such as SODIS, Piyush, Biosand filters were demonstrated in the exhibition. In addition to these options, traditional sanitation practices such as the practice of making organic compost “sagaa”, source separation practices using “copra” and innovative approaches like recycled handmade plastic products, tissue culture techniques were put up by the local women and youth groups. Prabhat Kiran Ranjit, coordinator of the event from CIUD said, “The over whelming participation in Nala was triggered by the community clean up campaign organized early in the morning and most importantly by people’s quest for knowledge.“ “The local denizens are very glad to have this type of exhibition in their village, which enhanced their knowledge on the environmental sanitation,” he added.